Everything can and should be taken to the next level. Why not by you? ‒ Help Others Grow and Thrive! Self-leadership is an extensive set of strategies focused on the behaviors, thoughts, and feelings that you use to exert influence over yourself. To lead yourself, create an → inspiring vision and set goals for your life. Visualize a life that is exactly as you want it. When you see your goal in your mind, you engage the power of your subconscious mind that will help you build winning habits and bring your dream to life. Now, take initiative and → start moving towards your goals. Challenge assumptions, champion change, take risk and experiment. And remember, there is no failure, only feedback. Ask learning SWOT questions and restart wiser. Fail small to succeed big. Be a lifelong learner, and be passionate about it. If you stop learning, you stop creating history and become history. Be a superleader – lead by example and help your people develop into leaders themselves. Empower, inspire and energize them. Be a coach for your people. Don't assume you know it all. Seek ideas from all team members. Ask questions and solicit suggestions. Be empathic and compassionate, and people will choose you to lead them. How to get things done when you are not the boss and telling → others what to do is ineffective? 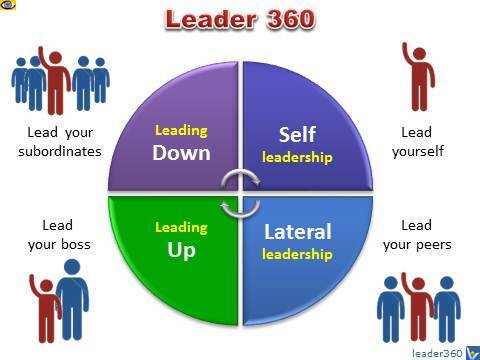 Lead laterally, help people around you achieve more and thrive. Invite colleagues to work with you to solve problems creatively, and achieve a common goal. "Don't try to provide a → solution to every → problem. They key is to improve the process of working together. Start the habit of everyone working to improve collaborative methods. Solutions are not the answer. The answer is a better process for finding solutions," advises Roger Fisher, the author of Lateral Leadership. Leading-up is about leading your boos, helping your supervisor to see the right goal and find the right path before too late. Once your boss knows that you bring judgement and get results, the way is clear for you to lead your boss. But your boss must want it and you must be able to deliver it. "Leading up requires an ability to work in two directions at once, of both stepping into the breach and listening to those below you before you step off a cliff yourself. Above all, upward leadership requires the conscious subordination of personal gain to organisational purpose. Leading the boss is therefore about helping the organisation to achieve its mission regardless of the personal costs or benefits. Upward leadership requires a driving urge to make things happen on high, an unflinching willingness to take charge when not fully in command.," says Michael Useem, the author of Leading Your Boss. "When a subordinate does lead up, it requires equal courage for the boss to listen down, especially in cultures that traditionally eschew voices from below. A culture that encourages upward leadership is built, not born. For that, senior managers must regularly insist that their junior staff question strategy and challenge error. Asking those of lesser rank to say what they candidly think and complimenting them for doing so are small measures that can make for big improvements."